This is where it starts for most grad students in oceanography—with CTD deployment from the starboard side of a research vessel while boarding seas slosh around their shins. 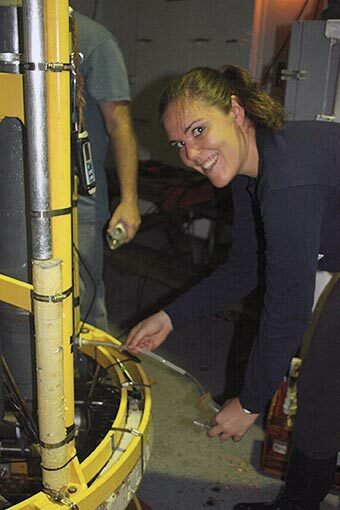 It was my first experience of at-sea research; Lisa’s career began as a student on a CTD watch. Some of our fine students have came aboard with a cruise or two in their logs, but for most, this is the first. The CTD watch is the minor leagues of physical oceanography. But that’s not to say that the CTD is minor to the science of the sea. On the contrary, it’s a fundamental tool for understanding ocean dynamics. 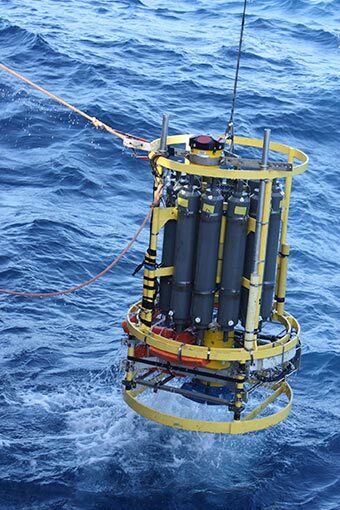 The CTD, measures salinity, temperature and depth. As we said earlier, when water masses move in currents around the world, they retain their temperature/salinity fingerprint, and so by gleaning those properties, oceanographers can follow the water. The device itself, called the “package,” consists most obviously of a set of water-sampling bottles, like skinny scuba tanks, mounted on a circular, steel frame. 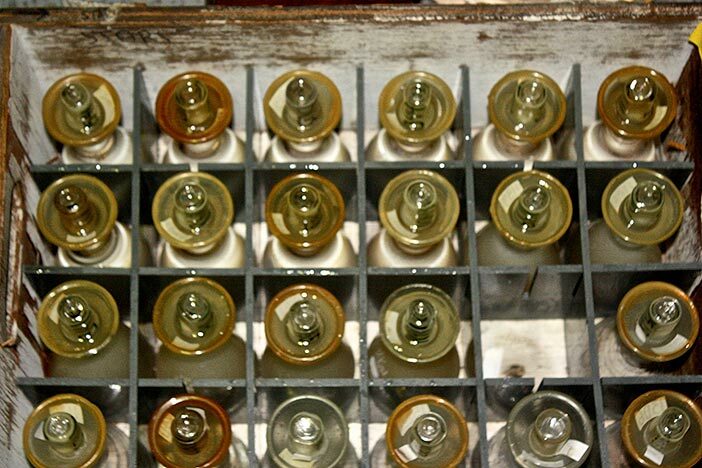 The bottles, which need to remain open at both ends on the descent lest they be crushed like paper cups by the water pressure, are triggered to snap closed, capturing samples at predetermined depths from an onboard computer. Temperature and salinity sensors and a battery pack are mounted beneath the bottles, and T/S data is transmitted in real time from the sensors to the main lab computer via the same specialized oceanographic wire with which the CTD is lowered and raised through the water column. Though a variety of instruments can be mounted on the package, Lisa, interested primarily in current velocity, has chosen two ADCPs, one looking up and the other down. That’s the package itself, now as to the deployment—it’s a labor-intensive process, requiring ship-wide cooperation. The bridge stops the ship at Lisa’s predetermined position. Students suit up in work vests and hard hats, positioning themselves on the starboard side with control lines in hand as the winch operator raises the package off the deck and lowers it down through the water column at 60 meters per minute. In 4,000 meters of water, it takes over an hour to approach within ten meters of the bottom—But don’t hit the bottom! The ship cannot simply park over Lisa’s chosen spot, because in a current as strong as the Agulhas, the package would stream away from the ship, “kiting,” its called, or worse abrading the wire against the ship’s hull. No, you want to measure the water column vertically, and this requires the bridge to “keep the wire straight” by maneuvering in relation to the wire angle. 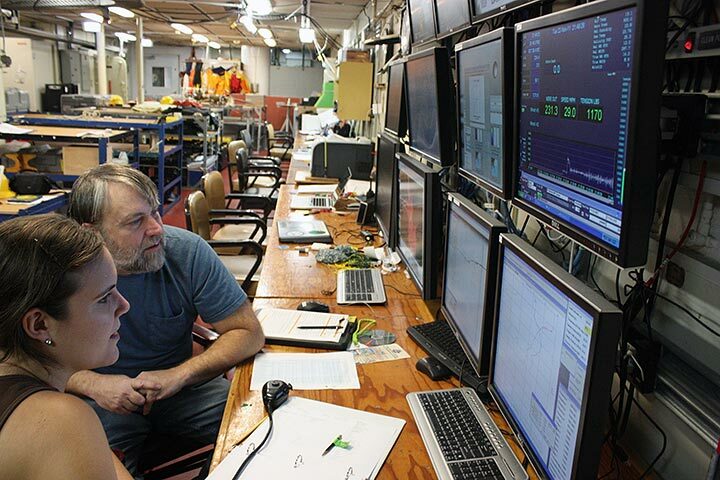 During the downcast, T/S, pressure, and oxygen data stream in to the main lab computer monitored by the watch standers. When the package reaches the target depth, the up-cast begins. Communicating with the winch operator, the watch stops the package at a set of predetermined depths where they “fire” a series of bottles to capture the water samples. When the package reaches the surface, sometimes hours after deployment, it’s secured on deck, and the watch begins extracting the water samples. On some cruises, multiple water properties are measured, depending on the science objectives; on this one, Lisa is interested in two properties, salt content and dissolved oxygen. That done, the ship heads for the next deployment position. By running a picket-fence pattern across the Agulhas, Lisa gains supplemental data about its behavior at that particular time. 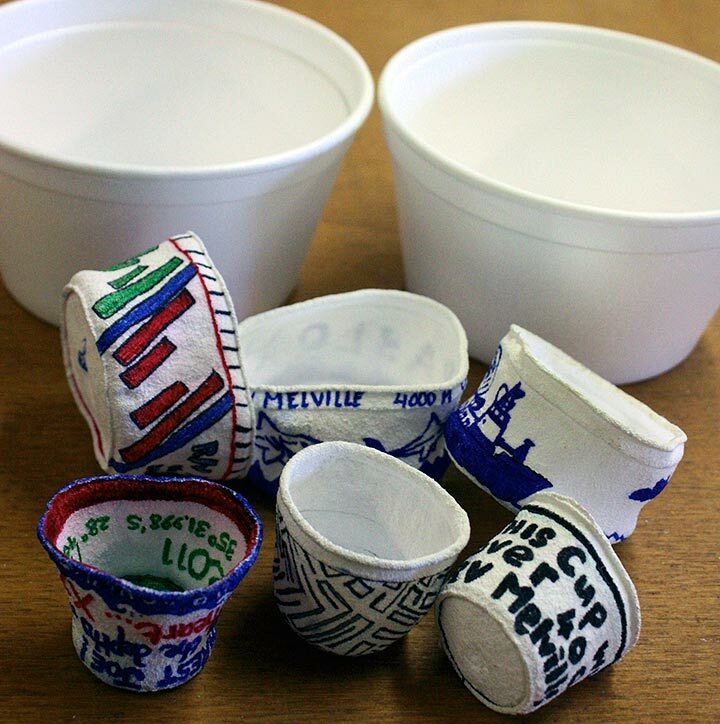 We would be remiss if we failed to mention another essential CTD-related oceanographic activity—the “cup cast.” First, you acquire Styrofoam coffee cups, draw pictures, write notes on them, then put the cups in a mesh bag, and send them down several thousand meters with the package. The water pressure reduces them to the size of thimbles. Then you give them to shoreside friends and loved ones as souvenirs of the ocean and its estimable power.